Secretary of State Rex Tillerson is greeted as he arrives at King Salman Air Base, Saturday, in Riyadh, Saudi Arabia. Manama: The United States is reportedly going for a new diplomatic push to resolve the Gulf crisis more than 135 days after it came out in the open. US Secretary of State Rex Tillerson is in the region for the second time to achieve a breakthrough in the dispute after Bahrain, Saudi Arabia, the UAE and Egypt severed their diplomatic and trade relations with Qatar on June 5 over accusations it supported extremists and funded terrorism. Tillerson will attend the inaugural Coordination Council meeting between the governments of Saudi Arabia and Iraq and will seek to boost the landmark warming of relations between Riyadh and Baghdad following years of tension. He will also work on narrowing the gap between Saudi Arabia, Bahrain, the UAE and Egypt on one side and Qatar, his next stop, on the other, and bring the countries to the negotiations table. 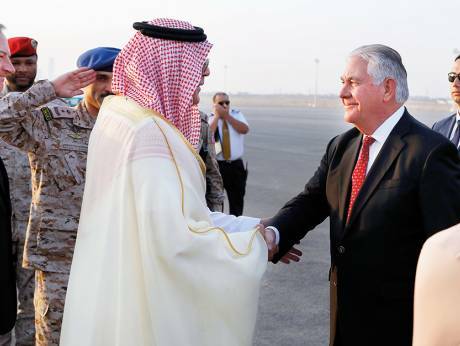 Tillerson in July visited Saudi Arabia, Kuwait and Qatar in his bid to bring the parties involved in the standoff together and start a dialogue. However, he came up short in his attempt to resolve the crisis, and at the end of his shuttle diplomacy efforts, he made no announcement of any incremental progress. “I’m tired, I’m tired, been a long trip,” Tillerson was quoted as telling reporters as he left Doha, the last leg of his trip. Three weeks later, Tillerson sent Tim Lenderking, deputy assistant secretary for Arabian Gulf Affairs in the Near East Bureau, and Retired General Anthony Zinni, a retired US Marine Corps general and a former commander-in-chief of the US Central Command (Centcom), to the Arabian Gulf in another attempt to help defuse the crisis. Tillerson’s second direct attempt to liaise between the two sides will face formidable challenges as the Quartet have clearly indicated that Qatar first has to respond positively to the 13 conditions they set in June days after the dispute broke out. As the US official resumes his diplomatic efforts, speculation in the region is mounting over whether the GCC annual summit scheduled for December will be held, delayed, cancelled or shifted to another venue. Last week, Kuwait’s Emir Shaikh Sabah Al Ahmad Al Sabah paid a one-day visit to Saudi Arabia, where he and King Salman Bin Abdul Aziz discussed the latest developments in the region. Then, Kuwait’s foreign minister held talks in Doha with Qatar’s Emir Shaikh Tamim Bin Hamad Al Thani. No reference to the summit or the meeting was made by the official news agencies of the three countries in their accounts of the visit. However, reports said Kuwait, which has been leading the mediations, was genuinely keen on holding the GCC summit that brings together the six leaders or their representatives. However, as the GCC Secretariat General has not yet signalled that the summit will go ahead, speculation about its fate have been mounting inexorably. The daily said Kuwait was opposed to shifting the venue of the summit to Saudi Arabia or the UAE, and to not inviting Qatar to attend. “The Kuwaiti mediation is working on proposals that cannot be divulged now particularly that some media and social media are working on undermining all attempts to fix the situation or to find a settlement for the crisis,” the diplomatic sources said, without elaborating.